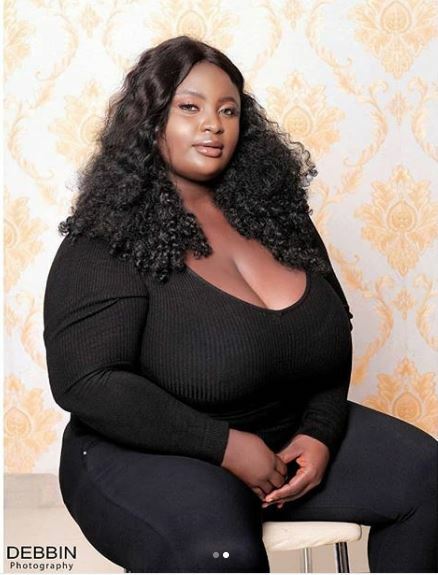 Today is the birthday of actress, On-Air-Personality and plus-size model, Angela Ele and she has posted some charming professional photos. Angela Value also known as Angela Ele is marking her birthday on social media and she has traditionally shared lovely photos of herself. The dark-skinned curvy woman who regards herself as a 'retired troublemaker' has in recent times featured in online comedy skits in which she wiggled to blow the minds of people. Some of her industry colleagues like Nedu Wazobia FM have been celebrating her on Instagram.